Wild Truffle Grows on Paris Rooftop, in Scientific Mystery. It’s not exactly the sort of thing you expect to find nestled on a rooftop in the centre of the bustling French capital. In fact, experts believe it to be the first discovery of its kind in Paris. The discovery in a hotel roof garden in the shadow of the Eiffel Tower comes as prices for the aromatic fungus have doubled to more than 5,000 euros ($6,000) a kilo. Coming just before Christmas, when truffles are used to flavour such seasonal foods as foie gras and chestnut soup, it raises the hope of an undreamt-of windfall for the new wave of urban gardeners colonising city roofs. “The discovery of this wild truffle is a wonderful example of how roof gardens and green roofs have a huge potential for urban biodiversity,” said the Museum of Natural History in the French capital, which revealed the find. It also raised the question of whether the micro-climates roof gardens foster might be particularly favourable for truffles, the museum added. The black “tuber brumale”, which tends to grow in the same regions as its more highly-prized cousin, the Perigord black truffle, was found at the base of a hornbeam tree on the roof of the Mercure Paris Centre Tour Eiffel hotel by Frederic Madre, a researcher from the museum’s centre of ecology and conservation. Madre is also a co-founder of the Topager startup which was responsible for putting organic gardens on the top of several major buildings in Paris. It plans to add another to the roof of the Opera Bastille. A 600-square-metre (6,450-square-foot) roof garden above the Pullman Paris Tour Eiffel hotel, around the corner from where the truffle was discovered, already supplies that hotel with honey, herbs, salad leaves and some of its vegetables and eggs, with chickens fed on its kitchen leftovers. Deeply-flavoured truffles are usually hunted down and dug out of the ground using dogs or specially trained pigs. 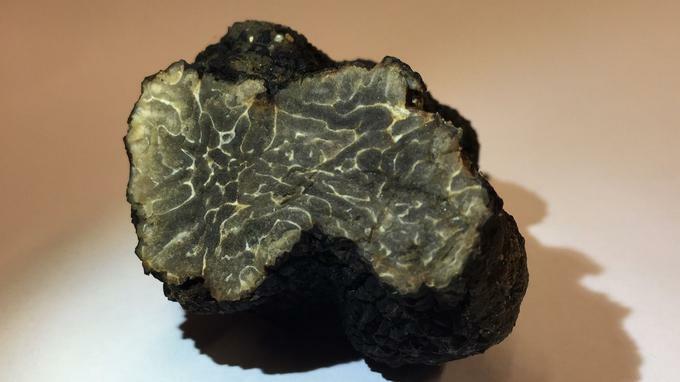 The variety found in Paris is said by experts to be stronger and muskier than the classic black Perigord truffle found in the warmer climes of southern France, Italy, Spain and Croatia. It has a light garlic aroma and a much more pronounced peppery flavour than the sweeter Perigord and Italian white truffles. Although cheaper to buy than its grander cousins, the tuber brumale is preffered by many chefs to flavour sauces, rustic sausage and potato dishes and carpaccios of scallops. The French capital is making a major push towards urban gardening, aiming to have 100 hectares of roof gardens in the next two years, a third of which will grow herbs, vegetables and hops to flavour beer. Underground car parks are also being turned over to grow mushrooms in beds made from used coffee grinds. More than 70 major companies have already signed up to have the roofs of their offices and buildings converted into vegetable plots.